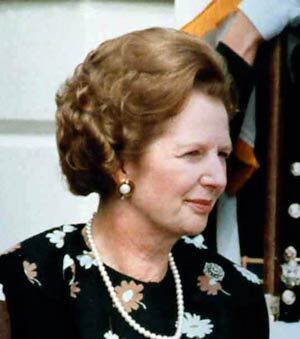 Margaret Thatcher (1925-2013) was Britain’s first female prime minister (1979-90). She was known for her tough uncompromising, conservative political views, and became dubbed as ‘The Iron Lady’. 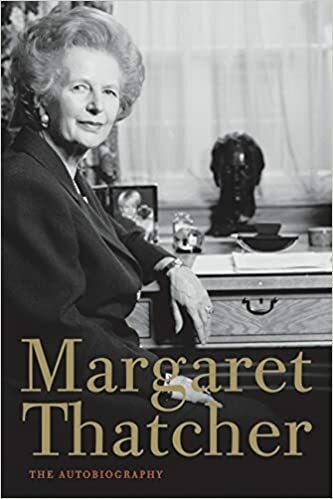 On the UK domestic front she instituted many free market reforms, implemented the controversial poll tax and reduced the power of trades unions. 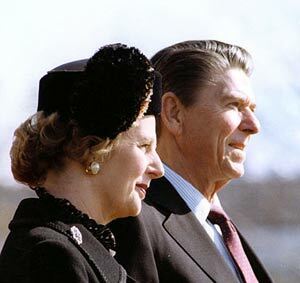 In international affairs, she cultivated a close relationship with American President Ronald Reagan and also developed a working relationship with Russian leader Mikhail Gorbachev as the Cold War drew to a close. Margaret Hilda Roberts was born 13 October 1925 in Grantham, Lincolnshire. Her father owned a grocery store and was active in the local Methodist Church and Liberal politics. Margaret won a scholarship to the local Kesteven and Grantham Girls’ School, where she became head-girl. She applied to Somerville College, Oxford University, and was accepted to study chemistry in 1943. She graduated in 1947 with second-class honours. During her time at Oxford, she was elected President of the Oxford University Conservative Association in 1946. After graduating, she moved to Colchester, where she worked as a research chemist for BX Plastics. In 1951, she was invited to stand as the Conservative candidate in the safe Labour seat of Dartford. Although she lost, she impressed many in the party with her strong, articulate views. She also married Denis Thatcher in 1951. In 1953, she gave birth to two twins Carol and Mark. In 1959, she was elected as MP for the seat of Finchley. Mrs Thatcher progressed through the ranks of the Conservative party to become education minister in Ed Heath’s government of the early 1970s. It was as education minister that Mrs Thatcher developed a rather crude nickname of “Maggie Thatcher – the milk snatcher” This was due to her policy as education secretary to end free school milk. However, although she was tipped as a rising star in the Conservative party, even as a cabinet minister, Mrs Thatcher proclaimed that Britain would never have a female prime minister. However, just a few years later in 1975, Mrs Thatcher defeated Edward Heath and was elected leader of the Conservative Party, and she became the leader of the Opposition. During the 1970s, Thatcher became acquainted with the ideological ideas of neo-conservative economists – influenced by figures such as Hayek and Friedman, they proposed less government, lower taxes and an end to Keynesian economics. This gave Thatcher a strong ideological stance, which she used to influence party policy. Many felt this was inappropriate given the recent casualties on both the British and Argentinian sides. Another defining feature of the early Thatcher administration was her battle with trades unions. Thatcher wanted to reduce the power of trades unions; in particular, she wished to reduce the influence of the militant mineworkers union, the NUM, led by Arthur Scargill. Mrs Thatcher prepared the country for a long strike; when the miners went all out on strike in 1984, they were eventually forced back into work after a year-long bitter struggle. Mrs Thatcher visited the Soviet Union in 1987, and was well received with thousands turning up to see the Iron Lady. The term ‘Iron Lady’ was initially designed as a critical label by a Russian newspaper in regards to Thatcher’s criticism of the USSR, but Thatcher seemed to revel in the label, and it stuck. Because of her declining popularity, she was eventually forced out as leader of the party and PM in 1990. Although she was bitter about her perceived betrayal, she left an unprecedented mark on the UK economic and political landscape. For good or ill, she changed the British economic and political situation. In particular, Thatcher marked a break with ‘One Nation Conservatism’ and the post-war consensus. It is ironic that when Labour eventually regained power in 1997, it was largely due to the fact Tony Blair and new Labour took on board many of the economic policies that Mrs Thatcher had initiated. There was often a mutual respect between Mrs Thatcher and Tony Blair. Thatcher died on 8 April 2013 at the age of 87 after suffering a stroke. Citation: Pettinger, Tejvan. “Biography of Mrs Thatcher”, Oxford, UK www.biographyonline.net, 11th April 2009. Updated 23 January 2018. Women who changed the world – Famous women who changed the world. Features female Prime Ministers, scientists, cultural figures, authors and royalty. Includes Princess Diana, Marie Curie, Queen Victoria, and Catherine the Great.